Ihsahn's sense of adventure is all over the place on Arktis, but fortunately that doesn't prevent the music from unifying into a compelling whole. Das Seelenbrechen (2013), Ihsahn's fifth studio record, is a progressive metal album, though not in the way most are inclined to think of the genre. There are no lengthy, suite-like songs in the vein of Dream Theater. Though there is some shredding on the album, none of it gets close to fusion jazz territory. Rather than drawing from sci-fi or fantasy for lyrical matter, Ihsahn prefers the existential proclamations of Friedrich Nietzsche; Das Seelenbrechen ("The Soul Breaking") takes its title from an aphorism in the German philosopher's volume Human, All Too Human. (Eremita, Ihsahn's 2012 release, features a picture of Nietzsche turned upside down.) Ihsahn culls more from avant-garde musicians like Scott Walker than he does the epically inclined Yes or Genesis. Walker's influence is all over Das Seelenbrechen, an album that hops around from symphonic metal (the dazzling "Regen") to free jazz ("Tacit") to dissonant experimentation ("See"). Having been one of the pioneers of black metal through his work in Emperor, Ihsahn's reach has expanded well beyond the Anthems to Welkin at Dusk years. Ihsahn's commitment to being genuinely progressive with metal is commendable, even when, as is the case with Das Seelenbrechen, the songwriting loses focus. The first half of Das Seelenbrechen contains some of Ihsahn's best work, but in the scattershot second half the music becomes a jumble of interesting but poorly executed ideas. Eremita, to date the best of Ihsahn's solo output, lacks Das Seelenbrechen's breadth of genre experimentation, but its nuanced and layered take on progressive metal is all the better for its compositional focus. The intermittent bursts of saxophone on Das Seelenbrechen are but one of many erratic intrusions; on Eremita, the saxophones complement Ihsahn's time-tested balance of staccato/legato guitar playing (see the majestic "Eagle and the Snake"). Arktis, Ihsahn's sixth studio affair, is a return to the controlled yet daring dynamics of Eremita. The opening three numbers – "Dissassembled", "Mass Darkness", and "My Heart is of the North" – are showcases for Ihsahn's brooding metal, with horns forming a powerful additional layer to the proceedings. Those familiar with records like Eremita and After (2010) will recognize the stylistics of these first three songs, although there are some new added touches, like the hair metal guitar that opens "Mass Darkness". After "My Heart is of the North", the signature Ihsahn sound takes a pause. The genre-eschewing ethos of Das Seelenbrechen is in the air right as the electronic opening notes of "South Winds" commence. One could call "South Winds" Ihsahn's "Marilyn Manson moment" and she wouldn't be entirely wrong. Ihsan's ultra-serious image as a solo artist doesn't quite comport with the dancefloor, and "South Winds" is definitely the kind of exercise that's meant to break with an established sound. When a djent-esque guitar kicks in to match the melody of the electronics, one would be forgiven for stifling a laugh. If nothing else, this electronic excursion is a nice sign that Ihsahn isn't overburdened by solemnity. "South Winds" also reveals that Ihsahn's omnivorous taste in genre hasn't waned any, although on Arktis it benefits from a more contained songwriting approach. Ihsahn's sense of adventure is still all over the place, but fortunately the music isn't. 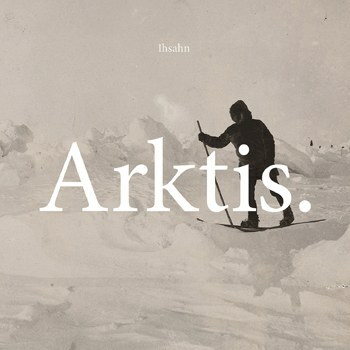 "South Winds" is the only moment where Ihsahn goes far off the reservation on Arktis. The rest of the album's 50 minutes consist of powerful variations on Ihsahn's portentous aesthetic. "Until I Too Dissolve" kicks off with a guitar riff that Eddie Van Halen would be proud to have written, later adding in some leads that could have been leftovers from Between the Buried and Me's Coma Ecliptic. The back-and-forth interplay of the guitars and piano on "Frail" is a welcome burst of energy late into the record. "In the Vaults" is topped off with an operatic coda that reminds the listener that Ihsahn is influenced both by Nietzsche and that philosopher's much-loved composer, Richard Wagner. The only slouch on Arktis is the low-tempo "Crooked Red Line", which like Eremita's "The Eagle and the Snake" features Shining frontman Jorgen Munkeby on saxophone. Ihsahn has used saxophone in his music successfully before, but "Crooked Red Line" feels incomplete and interstitial, especially considering that it is sandwiched between "Frail" and the tremendous "Celestial Violence", a clear inheritor to Das Seelenbrechen's highlight "Regen". Beginning as a faint piano ballad, with piano notes echoing in what sounds like a crisp winter wind, "Celestial Violence" erupts with powerful downward strums on the guitar that are juxtaposed with sharp guitar leads. Here Arktis improves on the songwriting of Eremita, whose primary weakness is frontloading. Arktis maintains a steady pace throughout, and even its brief lull ("Crooked Red Line") doesn't put a dent in the triumphant conclusion of "Celestial Violence". Like Eremita, Arktis benefits from striking album art that perfectly complements the music within. Listening to these songs, one can easily imagine Ihsahn trekking through an icy landscape, dreaming up songs to capture the violent weather ahead of him. Filtered through an imagination like Ihsahn's, an image like that could go any number of directions. Das Seelenbrechen gave the world Ihsahn unfiltered, which was not without its flashes of brilliance. The value of Arktis, however, is that it reveals that brilliance through a cohesive whole, with just about every song delivering heavy riffs and cinematic sonic landscapes. All that, and it even gives you time to dance for a couple of minutes.